Provide comfort for the family of Coleen Bodnarchuk with a meaningful gesture of sympathy. It is with sadness that we announce the passing of Coleen after a short battle with cancer. She is survived by her mother Faye (Bob) McClain of Hubbles Lake, Alberta and her two sisters Janice Eliasson (Keith Falkenberg) and Lisa (David) Cranstone of Calgary, and by her step-brother Darin (Jennifer) McClain of Maple Ridge, B.C. Coleen will be missed by her beloved nephews David and Kevin Falkenberg. She was predeceased by her father Eugene. Coleen was a Fine Arts graduate who was skilled in crafts work. For years she has been crocheting Malawi comfort dolls that are used for packing medical supplies and she donated over 1000 of these to Doctors Without Borders. 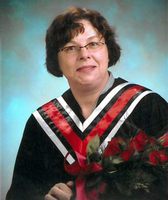 Coleen was proud of her work as an Administrative Assistant at the Haskayne School of Business, University of Calgary. She enjoyed helping faculty and students especially with the preparation and giving of exams. Coleen had a great love for animals. In particular she was extremely fond of her dogs that she rescued, Binky and Ginny. If friends so desire, memorial tributes may be made directly to the Calgary Humane Society, 4455 110 Ave SE, Calgary, AB T2C 2T7 (www.calgaryhumane.ca). A memorial service will be held later this year in Edmonton. To view and share photos, condolences and stories of Coleen please visit www.choicememorial.com. We encourage you to share your most beloved memories of Coleen here, so that the family and other loved ones can always see it. You can upload cherished photographs, or share your favorite stories, and can even comment on those shared by others. Provide comfort for the family of Coleen Ann Bodnarchuk by sending flowers. I will miss your laughter and smile Coleen. Also you and I teasing Janice was a lot of fun. Rest well and keep laughing.